It is so surreal to travel the world this much in such a short amount of time. Hey, it’s surreal playing with the biggest pop star today too, especially since I never anticipated my career going down this path. Believe it or not, out of all the things the be amazed by in my travels, a big one is the weather. I grew up in New Jersey where we experienced four seasons. Whereas now, I’m traveling the world and will experience the northeast’s fall in South America and Australia (more summer for me, I suppose!) Sounds like a dream to most, (me too!) but I have to say I will miss New York in the fall time. It’s one of my favorite places to be at this time of year. 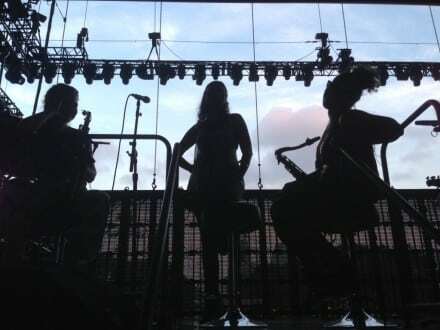 It hit me tonight when we were sound checking in Philly; the sun was going down and it was getting cooler and I finally got that “it’s getting to be fall soon” smell. It’s a beautiful thing. It’s Labor Day weekend and it’ll conclude the summer and begin the new chapter of Fall. 10 months ago, I had no idea I’d be where I am now in my career. I thought I’d be starting my second year of my Master’s degree at Juilliard (my 6th year total..whoa) and getting back into the school/shed grind. So much has changed, and what a trip it’s been so far! I am so blessed and grateful. I know it’s not even close to being over, so I will continue to keep you guys posted on all of the exciting things happening! In the meanwhile however, I will continue to pack everything from shorts to warm jackets in my suitcase because this weather will throw me for a loop.